(1:45 p.m. EST) -- British cruise line Cruise & Maritime Voyages has secured the three-year charter of a cruise ship to sail between the U.K. and Australia beginning later this year. The 620-passenger, 20,000-ton Astor, will join CMV's fleet in November 2013, and will sail both northbound and southbound voyages, by way of South Africa, as well as round-Australia and Asian itineraries. CMV will be opening a sales office in Sydney to market Astor's sailings in the region. The line's move into the Australian cruise market does not come as a surprise. 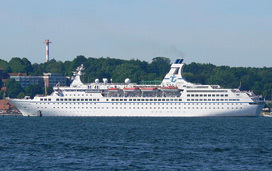 In October 2012, CMV attempted to charter the German cruise ship ms Delphin on behalf of Classic International Cruises for a series of ex-Australia cruises. CIC was unable to operate the cruises after four of its fleet of ships were arrested over financial disputes. But the arrangement ultimately fell through because Delphin's owners couldn't get the ship ready in time. A spokesman for CMV told Cruise Critic that the line "had been considering [an Australia move] for some time." "The gap in the market left by Classic International Cruises accelerated matters," the spokesman added. And when the opportunity to charter Astor presented itself the company acted quickly. CMV said Astor will be slightly higher-end than the current ships in its fleet, the 22,000-ton, 800-passenger Marco Polo and the 20,000-ton, 650-passenger Discovery. Astor has 289 cabins, 70 percent of them with an ocean view, but only three cabins with balconies. In terms of dining, the Waldorf Restaurant will be the main dining room, with the Club Bistro being the ship's informal dining venue, and two additional dining rooms -- the Romantic and Toscana Dining Rooms -- used for themed dining and other special occasions. Fitness and spa options include one outdoor and one heated, indoor swimming pool, a wellness centre with a salon, massage studio, sauna, and two whirlpools, and a sport deck. In addition to a wrap-around jogging track, the sport deck has a volleyball court, half tennis court, mini golf range, big board chess and yoga area and fitness and medical centres. Astor is the second ship to be added to the CMV fleet in the last six months. CMV chartered the 650-passenger Discovery for use in 2013 from another British cruise line Voyages of Discovery in August 2012, to replace Ocean Countess.